Father Noel was simply fantastic from start to finish. We wanted a priest for our outdoor ceremony and wanted to include some religious elements, but didn't want it to feel like a mass either. From our first meeting with Father Noel, we knew he was the right choice. He welcomed us into his home where we chatted about how we met, our relationship and what we wanted our ceremony to feel like and be. He was always there for us throughout the process and answered any emails/questions very quickly. At our wedding, we did not have any time to rehearse, and Father Noel still carried out a flawless ceremony with no problem. 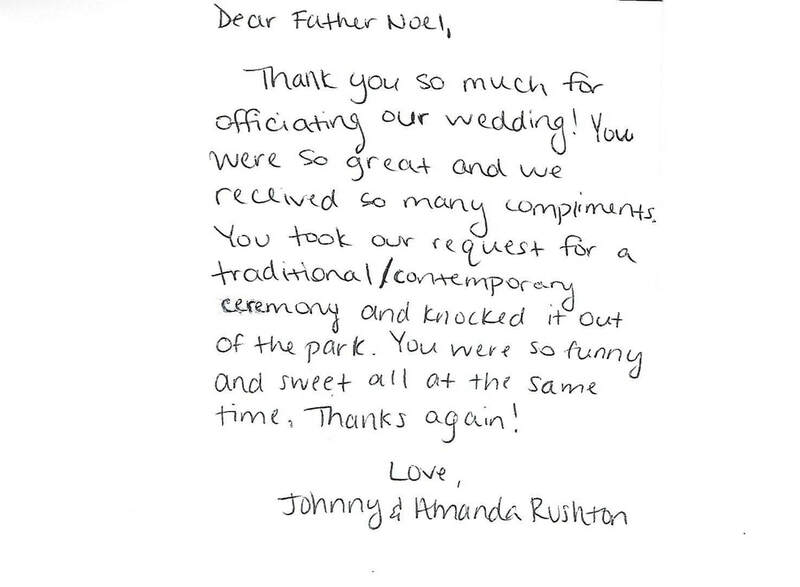 Our guests are still complimenting us on what a beautiful ceremony and wonderful job Father Noel did. 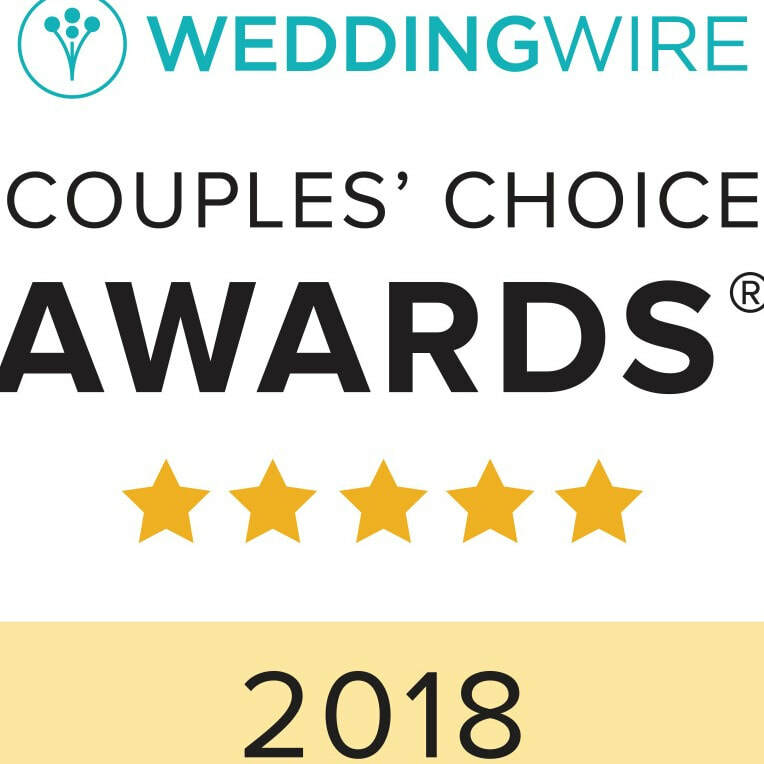 We could not be any happier with our experience! Sorry for the delay in reply- we just got back from our honeymoon. Already received our marriage certificate in the mail- thank you! Thank you so much for your services- it was truly a beautiful ceremony and my favorite part of the entire day. Our guests are still complimenting you, telling us how wonderful you were. Thank you for everything. I will definitely be posting reviews very soon and will recommend you to anyone we can. I have not received professional photos yet, but I have attached some photos my guests captured if you wish to use. As soon as I receive the photos from my photographer, I can send you these as well. Fr. Noel was absolutely fantastic from the moment we contacted him right through to the prompt filing of our marriage certificate! He took the time to meet with us and get a feel for the type of ceremony we wanted and then executed it beautifully! Well done. My bride was nervous and wanted a priest who was gentle in his approach and non judgmental. We interviewed a number of officiants and were blessed to meet Father Noel who was highly recommended to us. He led us through the process in a relaxed manner , taking care to listen and respond, explaining all questions in a detailed manner. On our wedding day we entered into the spirit of the ceremony and with our guests were relaxed and at ease. Father Noel was reverential and sacred while at the same time he was down to earth and quite humorous which please us no end. We recommend Father Noel with gusto and gladness. Want a super officiant? Look no further than Fr. Noel. As we both are nervous and fashionably giddy, Fr. Noel pulled of a superb ceremony. We were made to feel special and felt so relaxed. All enjoyed the ceremony style. Perfection. We are still feeling the vibe! posted 07/18/2018 by Francois D Bonjour, We were married in New York's Central Park in June past Frere Noel was recommended to us by a friend whom he had married 3 years previous. He was gracious, considerate and so patient with us as we planned our ceremony from Strasburg. France The final wedding ceremony as so perfectly tailored to our demands- we love perfection. He was comical in a respectful way, allaying our stress while reverential to the ceremony content. We commend Fr. Noel with enthusiasm. Merci. We could not have been more pleased with Father Noel! My husband and I grew up Catholic, but decided to get married outside of the church. We met with Father Noel and instantly felt at ease with his calming demeanor and wonderful sense of humor. Over the next few months he helped us create our perfect ceremony. The day of our wedding he arrived early, and put us both at ease. All of our family members raved over him; he made us laugh, reflect, remember and included the perfect amount of prayer. You will be so happy to have Fr. Noel marry you! We were married in New York's Central Park in June past Frere Noel was recommended to us by a friend whom he had married 3 years previous. He was gracious, considerate and so patient with us as we planned our ceremony from France The final wedding ceremony as so perfectly tailored to our demands- we love perfection. He was comical in a respectful way, allaying our stress while reverential to the ceremony content. We commend Fr. Noel with enthusiasm. posted 07/18/2018 by Francois D (07/18/2018)Bonjour, We were married in New York's Central Park in June past Frere Noel was recommended to us by a friend whom he had married 3 years previous. He was gracious, considerate and so patient with us as we planned our ceremony from Strasburg. France The final wedding ceremony as so perfectly tailored to our demands- we love perfection. He was comical in a respectful way, allaying our stress while reverential to the ceremony content. We commend Fr. Noel with enthusiasm. Merci. posted 07/12/2018 by Nigel PJune 16, 2018 "Our initial officiant bailed on us and we needed a substitute asap. The venue recommended Fr. Noel who obliged us at short notice. It was an inspiring choice. He went out of his way to meet with us and personalized the ceremony to our liking. We were told by our guests that he was powerful as an officiant. We had a ceremony that ran smoothly and was easy going and had appropriate moments of humor added in. I recommend Fr. Noel without hesitation. Rebecca and Nigel"
posted 06/26/2018 by Petra GCheryl said... We chose Fr. Noel for our wedding this past August in Lake George, NY. Fr. Noel was gracious enough to come all the way to Lake George from Yonkers. We were never able to meet up with him in person but we were able to Skype with him during the planning which was very helpful. We really liked how he helped us customize our wedding ceremony. He was able to send us examples and layouts which was very helpful when planning the ceremony. He did such a great job! It was very touching and heartfelt but also made everyone laugh. It was a great decision to choose Fr. Noel for our wedding and we would recommend him to anyone! Fr. Noel Clarke performed an interfaith marriage with our Rabbi for us and they were great! The ceremony was light/fun hearted and seamlessly intertwined our Jewish and Catholic faiths. They personalized our ceremony and it was just so special and perfect. 5.0 It was a great pleasure to work with Fr. Noel Clarke. From our initial meeting with him we knew that he would be ale to help us curate the ceremony that my wife and I were looking for. Due to our different religious backgrounds he was able to blend together important aspects of both faiths into a ceremony that was truly enjoyable. It was the perfect balance of spiritual and contemporary with just enough humor to keep everyone in the audience involved. We highly recommend Fr. Noel to provide a unique experience who takes into consideration what your are looking for and certainly delivers it. Thank you very much for the lovely ceremony you performed today, it was lovely and such a blessing. We chose Fr. Noel for our wedding this past August in Lake George, NY. Fr. Noel was gracious enough to come all the way to Lake George from Yonkers. We were never able to meet up with him in person but we were able to skype with him during the planning which was very helpful. We really liked how he helped us customize our wedding ceremony. 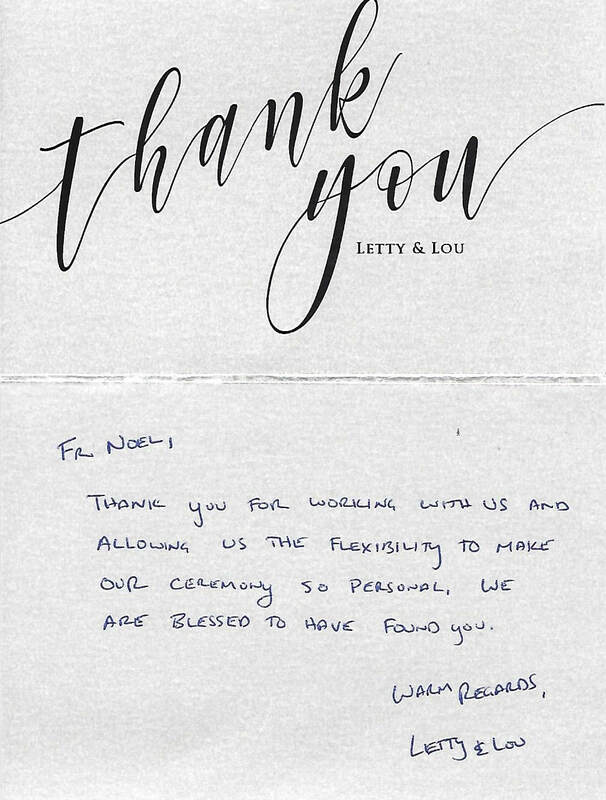 He was able to send us examples and layouts which was very helpful when planning the ceremony. He did such a great job! It was very touching and heartfelt but also made everyone laugh. It was a great decision to choose Fr. Noel for our wedding and we would recommend him to anyone! Father Noel was amazing, he was very responsive to all communications before the wedding day and on the wedding day he was there well before the ceremony. I can't even say what time he arrived since he got there before I did (at least 2 hours early). This helped put me at ease knowing the one marrying me to my bride was there. The ceremony was great, we wanted something spiritual and he definitely delivered on that, everyone attending enjoyed the ceremony. Would definitely recommend him to anyone needing an officiant. I hope you had a good Thanksgiving. It was very beautiful and we love how you describe the meaning of butterflies into our ceremony. Here is the link to our cinematic wedding video and I hope you enjoy it. Have a safe and joyful holiday. Thank you father Noel, our ceremony was one of our favorite parts of our wedding and couldn't have asked for anything more! I will leave a review right now our guests raved about the beautiful ceremony you performed! Alex and I will always have a special place in our hearts for you and your words about our commitment and marriage! 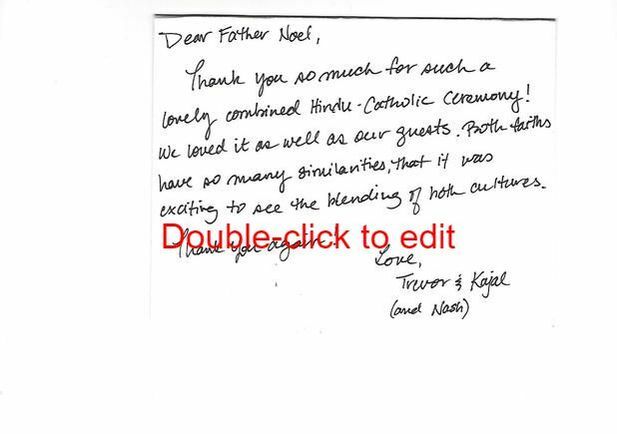 "I recommend Fr Noel as your wedding officiant. He was a gem to work with, polite, humorous, professional and available at a minute's notice. he encouraged we personalize the ceremony so it reflected our passion and love. It was a relaxing and a spiritually filled experience. Stephanie and Carlos"
"Our initial officiant bailed on us and we needed a substitute asap. The venue recommended Fr. Noel who obliged us at short notice. It was an inspiring choice. He went out of his way to meet with us and personalized the ceremony to our liking. We were told by our guests that he was powerful as an officiant. We had a ceremony that ran smoothly and was easy going and had appropriate moments of humor added in. I recommend Fr. Noel without hesitation Rebecca and Nigel"
"Fr. Noel n official who is a joy to work with. very flexible, understanding and generous of time and talent. Our guests were delighted with his humor and I was so at ease despite my stress. I recommend Fr. Noel highly. Bonita and Carmine June 11, 2017"
Father Clarke did a wonderful job officiating our wedding and was helpful and easy-going throughout the process. My (now) husband and I wanted to get married in Central Park, but we were from Florida. Fr.Noel arranged Skype meetings, discussed with us our wishes and desires. He made it happen. The ceremony was slightly delayed, but none the less he was patient, friendly and I couldn't have asked for a more perfect ceremony. Thank you Father! We highly recommend Father Noel Clarke to any couple who wants to have an outstanding ceremony that is thoughtful and respectful. In addition, Father Noel is very interested to get to know you, and to write a ceremony that is specific to your wishes and thoughts. He met with us for hours, to get to know us better before telling us about different types of ceremonies that are possible. We highly and enthusiastically recommend Father Clark. I love Fr. Noel! I would highly recommend him to everyone! He is very friendly, accomodating, very easy to reach, super responsive with my emails and questions and very helpful in figuring out stuff for our wedding! It was truly a blessing to have found him! Everyone in our ceremony loved him as well. 100 stars is not enough to rate him. Thank you so much Fr.Noel. We wish you all the best! Father Clarke was great and we were thrilled to find him. He was genuine and respectful. Fr Noel did a outstanding job during our ceremony and exceeded our expectations. He was able to blend our Catholic and contemporary styles to form the perfect ceremony for us. He made himself always available during the process and was very accessible through skype or meeting him in person. We had many compliments from our guest and kept the ceremony light and funny with maintaining a spiritual concept. We definitely would recommend him to anyone! Father Noel is warm and funny. He was extremely flexible with our ceremony planning, and all of our guests loved him. I definitely recommend him! Father Noel did a beautiful job officiating our wedding and was an absolute pleasure to work with. From our initial meeting through the followup discussions leading up to our wedding day, he did an amazing job - everything was perfect. It was clear to me, from our very first conversation, that he truly cared about what we wanted and also helped us along the way to incorporate items into our ceremony that we may not have otherwise thought of and helped us find the perfect mix of contemporary/traditional we were hoping for. Many thanks to Father Noel! Father Noel was an amazing officiant for our wedding and an absolute pleasure to work & correspond with. He walked us through the entire process with ease and stressed the importance of making the ceremony our own, which we ended up being extremely thankful for. He was always readily available to answer any questions we had and provided us with any guidance we needed during the process. While he is very professional, he was able to keep the ceremony light-hearted and fun (at our request) and many of our guests mentioned how much they liked it. Overall, if you are looking for an officiant to make your ceremony beautiful and unforgettable, Father Noel is a great choice! I cannot say enough about Father Clarke! I am Catholic and my husband is Episcopalian - neither of officially belong to a church and I had gotten a bit of run around when I went to the church that I had gone to growing up so we decided to find an alternative. Father Clarke was incredible! My Catholic family was so impressed by the ceremony - we had basically a Catholic ceremony without communion outdoors at our beautiful venue at River Stone Manor in Glenville, NY. We had a Skype meeting with Father Clarke when we were deciding to use him and he was very friendly, asked us about how we met, what we were hoping for in the ceremony, what we like to do together, etc...and that was our only meeting with him. He had extended an invitation for us to come down to meet him in person and was available at any time - we had several email communications along the way - but we were just too busy with work to make the 2 hour trip downstate to meet. So, we were a little worried about how the ceremony would go. We were completely floored - despite having just that one meeting, a few emails, and a little discussion with me alone before the ceremony, our ceremony felt like he had known us for years! He completely personalized his remarks, he was funny - we have so money wonderful pictures of us from the ceremony where the 2 of us were laughing - he was so amazing I wish that he was a priest in a local church because I would go back just to listen to him! He put us both completely at ease, we felt special, we felt that he really knew us, and it was a wonderful experience for us as well as our family and friends - even my conservative Catholic family. Now that we are back from our honeymoon, when we see people from the wedding almost always the first thing they say is "where did you find Father Clarke? He was incredible!" I would highly recommend Father Clarke for your ceremony!! !